Theory: A sense of humor is to every human quality as salt is to every food. It doesn’t take much, but the lack of it will pretty much kill whatever you’re serving. Love? Good, but when it’s dead serious it’ll suffocate a person. Dignity? Admirable, but without a sense of humor you’re just stiff and pompous. Charity? Without humor it turns condescending. And that’s the good qualities. When it comes to the bad ones, the lack of a sense of humor will move them from undesirable to downright dangerous. And so, as a person excessively fond of a laugh, I was careful with my blogs in Saudi Arabia. 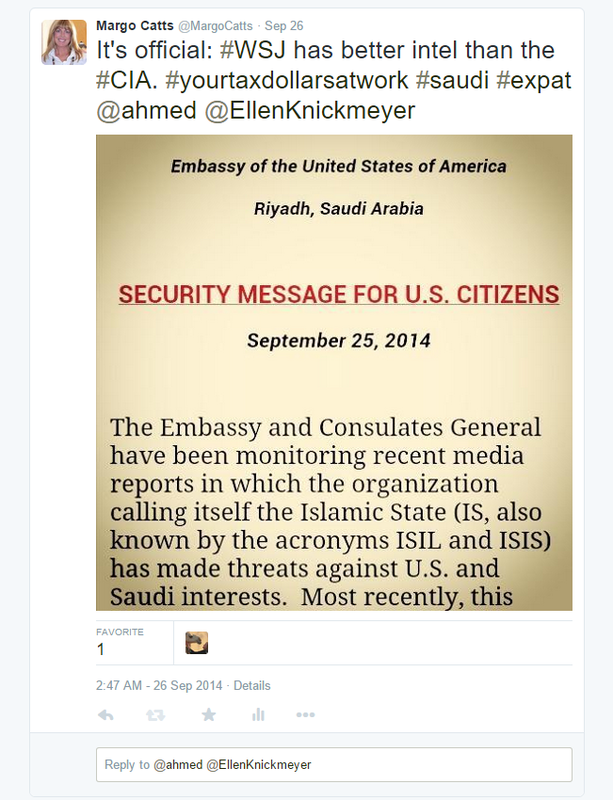 Saudi officialdom is not known as a hive of yucksters. Freedom of speech is not thought of or practiced anywhere in the world as liberally as it is in the U.S., and Saudi Arabia is particularly far toward the other end of the spectrum. People are in prison in Saudi Arabia over what they’ve said in blogs or in addresses. Even after being in the country for many months I was shocked to hear Saudi Arabia criticize Norway on human rights because it refused to stop people from insulting Islam. What the—what?!? Free speech is not a right, but protection from offense is? And we’re supposed to just guess (always correctly) where the lines of offense are? All the lines? Because the line is going to move depending on one’s sense of humor. So, yeah. I was careful. Particularly in the areas in which there was known to be NO sense of humor. Those two areas are quite clearly demarcated: In Saudi Arabia, there is to be no criticism or undermining of the monarchy or of Islam. Period, end of statement. Zip. Zero. After that, things get fuzzier. I took my cues about what was okay to talk about from the English language newspapers, which are complete toadies of the government. In fact, poking fun at the newspapers was often the best sport of all. (My personal favorite, this one, in which I made a flow chart of the logic in one editorial.) I figured that if the newspaper talked about it, and published diverse responses in the comments, I was safe to go after it, too. So I was scrupulously careful to stay away from the hot buttons. I was respectful of the monarchy (and remain truly fascinated by their political skill), and as a person of faith myself, I am enthusiastic about and supportive of Islamic faith. Still, a little over a year into my journey, I got into trouble. And after all my care and respect, you want to know what did it? A joke about my own government. The picture was of me. And there was my joke. If it’s not self-evident to you, let me explain. The U.S. Embassy regularly sends out security updates to citizens who put themselves on the email list. On this one, I got a kick out of seeing that the Embassy was issuing warnings based on media reports–you know, like we’re all capable of seeing and drawing conclusions about ourselves. Har-har! Wall Street Journal, 1. Central Intelligence Agency, 0. Okay, not my best work, but certainly not subversive. And for heaven’s sake—I was making fun of American intelligence services. Americans do that, and it’s just fine. (Get Smart, anyone?) I don’t think the CIA could possibly care any less about what I think is funny. So why did the Saudis? I have a few theories. For context, it’s important to understand how afraid of its own people the Saudi government is. Since the 1979 attack on the Grand Mosque in Mecca, the monarchy has been acutely aware of the danger lurking among the most conservative of its conservative people. Today the largest portion of foreign fighters in ISIS come from Saudi Arabia. The stated goal of ISIS is to take over Saudi Arabia and reclaim the holy sites of Mecca and Medina for the caliphate. Bombings and shootings within the Kingdom make it abundantly clear that there is a sizeable following for ISIS and its goals among the citizenry. 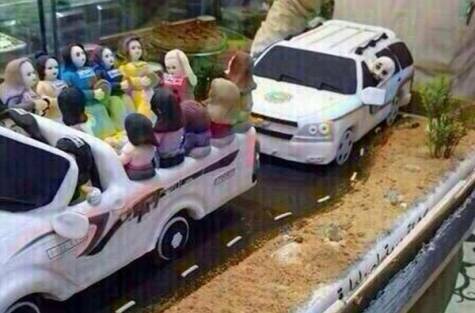 So the Saudi government puts a lot of effort into knowing what its people are up to. At the heart of that effort is social media. Governments everywhere are far less concerned with groups of people having secret meetings in basements than they are with Facebook groups, email chains, Twitter messages. Saudi intelligence operatives have become expert at not just teasing out the identities behind onscreen persona, but in piecing together social networks. Who somebody is is less important than whom that person knows, and whether those people all know each other. Once you can see what ripples through those networks, your chances of intercepting trouble have multiplied. Enter my lowball joke. I think what happened is a combination of things. First, keywords will always get flagged. I can guess pretty confidently that “CIA” is one of them. That might be all there is to it, but I have reason to believe the blog doubled things down. I doubt the Saudis care very much about the musings of random expatriates in their home languages, read by one or two hundred people, but I had published one post a few months earlier that drew an unusual amount of traffic. (In a twist of irony, the blog talked up life in Saudi Arabia and how valuable the experience was. It drew a ton of comments from people saying how much they also loved living or growing up there.) With the number of Facebook shares it would not have gone unnoticed. So when the person a lot of people have been reading is suddenly the same person who tweets about the CIA, well, you’ve got somebody to watch. Or, you do if you don’t have much of a sense of humor. Paranoia, touched with a dash of humor, can be made downright endearing. Without a sense of humor it can be pretty destructive to relationships, no matter how reasonable it may be. Innocent or careless actions get blown way out of proportion and everyone involved gets needlessly hurt. I sure was. After a year and a half of living happily in Saudi Arabia, loving the Saudi people and the fascinating mix of cultures from all over the world, eager to see what my next adventure would be, I was so completely creeped out by the idea of being surveilled that I honestly considered packing my bags and going home. I was angry at being so ridiculously misunderstood. And above all, I felt trapped. I was confident my circles of Facebook, Instagram, and Twitter connections had now been identified and were under extra surveillance because so many of them also knew and were connected with each other. (No warrants or justification are needed for private communication to be intercepted and read, and expat worlds are small.) Plans for innocent gatherings at people’s homes or for a day out were subject to judgment and could get people in trouble. No explanations or justification required. I couldn’t bear the thought that something I said could cause trouble for my friends, but there was not one thing I could do about it. I had done nothing wrong. I’d made one of 15,000 jokes against a kicking boy of American humor and written an upbeat article that 15,000 people had read. The problem now seemed to be that I simply existed in a visible way, which I could do nothing to change. I wrote a post early in my stay positing a theory that you could mark the divisions between first, developing, and third-world countries by examining the plumbing. I was wrong. It’s the humor. First-world countries can laugh at themselves, and aren’t threatened by people who straight-up make fun of them or their leaders. After that, the more seriously leaders take themselves, the more desperate the political situation. I mean, you can tell how despotic a dictator is by how many meaningless medals are pinned to his made-up uniform, can’t you? By whether he brandishes a weapon to punctuate what he says. And by how quickly someone would land in prison for laughing about either one. You can also predict how his own story is going to end and it doesn’t usually involve dying at home, rich and happy and surrounded by people who love him. So, monarchs and dictators of the world, take a note. If you want to stay in office, lighten up. If you want to stop being afraid of your people, let them laugh. Because if nobody’s laughing, you’re already in trouble. Of course you didn’t. People should always be meek and serious and respectful. And never, never sarcastic.